Need a refreshing sip poolside? 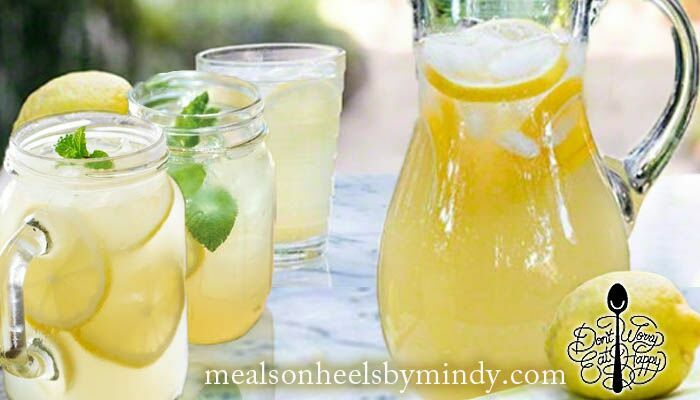 We’ve got you covered on those lazy days of summer with our Southern Mint Lemonade. For more yum, giveaways and our food philosophy, be sure to sign up for our Seasonal Newsletter and follow us on Facebook, Twitter, Instagram and Pinterest. PS We truly get a kick out of your favorite food pic moments with friends and family! Remember to share that love and post pics with hashtag #DontWorryEatHappy. To make fresh simple syrup, combine sugar and 1 cup filtered water until dissolved over medium heat, in a small saucepan. Whisk and set aside to cool. In a large pot, boil remaining 6 cups of water. Add lemon rinds and lemon pulp. Cover with lid and allow to steep for 15 minutes then strain. Combine all ingredients including mint leaves into a tall pitcher dispenser. Refrigerate until cold. Add simple syrup and 1 cup of ice. Stir.